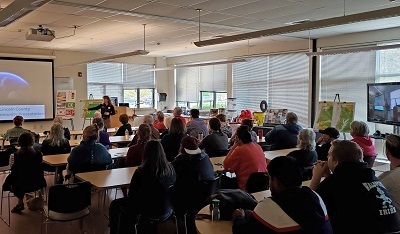 Oregon Coast Community College rents classroom space for educational and business use consistent with the mission of the College. It is not the intent of the College to compete with private sector providers of meeting space. Interested in setting up a table at an OCCC facility? Consult OCCC’s vendor tabling procedures. Please consult the tabs below before submitting your request. 1. OCCC sponsored or related programs. 2. Educational, civic, charitable and cultural programs sponsored by local non-profit agencies or organizations located within Lincoln County. 5. Groups affiliated with Federal agencies. The community room (CC-140) at the OCCC Central County Campus has an occupancy capacity of 50 guests at tables or 80 as audience (no tables). The central commons at the OCCC Central County Campus has an occupancy capacity of 60 guests at tables or 145 as audience (no tables). The use of community rooms or the commons are not guaranteed but alternatives will be offered when possible, including conference rooms, classrooms, or computer labs. OCCC has available computers, projectors, microphones and speaker systems, televisions, free internet access, and the ability to accommodate your technology as well. The use of the college’s AV equipment for an additional fee. Attached to the Newport Central County Campus community room is a full kitchen with fridge, sink, microwave, and gas range. The use of the kitchen is available for an additional fee. Food is allowed in the community rooms and commons. If your event is being catered please inform us. Inform your caterer of our location with the address and room name/number. OCCC’s Your College Store can provide limited catering on request, at an additional cost, with a two-week notice. If you’d like a sample menu please email officeofinstruction@oregoncoastcc.org. The Facilities Manager is responsible for managing all OCCC facilities, including the Community Room, Commons, and Computer Lab. The Manager or duly authorized onsite designee shall implement the policies outlined in this document. The fact that a group or organization is granted permission to meet at the College in no way constitutes endorsement by the College or the Board of Education of the policies or beliefs of that group or organization. The College reserves the right to deny future use of the college’s facilities to groups or individuals that do not follow the College’s policies. The meeting rooms or computer labs shall not be used for any purpose that would prevent, discourage or interfere with the use of the College for purposes of learning, research, reading and study. Users of the meeting rooms or computer labs may be asked to leave if use is deemed disruptive or in any way contrary to College policy. Unless admission is charged or a meeting is limited to a group’s membership, any person may attend a meeting so long as that person complies with College policies. Activities for minors, age 17 and under, must be supervised by responsible adults. Permission to use the meeting rooms or computer labs is not transferable by any guest whose application is approved. Smoking is not allowed in OCCC facilities or on OCCC property. The guest is responsible for enforcing this policy. Animals, other than service animals (such as seeing-eye dogs, etc. ), are not allowed on OCCC property without the expressed permission of the College President. The guest is responsible for enforcing this policy. No candles or open flames without written approval from Facilities Manager. Alcoholic beverages are not allowed in or around the College. The guest is responsible for enforcing this policy. Fundraisers of any sort are considered a commercial use and fall under #6 in the priorities list. The guest shall hold the College, its employees, and agents harmless from any claim, loss, or liability arising out of or related to the guest’s use of the premises, or from any condition of the used premises, including such claim, loss, or liability which may be caused by or contributed to in whole or in part by the College, its employees and/or agents. The guest shall indemnify the College, 1) for any damage to College property occurring during the use thereof, whether or not the guest is responsible therefore, and 2) for expenses and cost, including attorney’s fees, incurred by the College or its employees and agents, in defending against any claims or demands for losses or liability arising from or related to the guest’s use of the premises. The sponsoring organization or individual is responsible for any refreshments served, for keeping food and drink within the designated meeting space, for cleaning up afterward, and for returning the room to its original condition. Time for setting up the meeting and cleaning up afterward should be included in the meeting time requested (we recommend including 30 minutes before and after your requested time for set-up and clean-up). While the college will attempt to communicate any sudden closures due to inclement weather, it is the guest’s responsibility to check the college is open the day of rental. Closures will be announced through FlashAlert, the college website at oregoncoastcc.org, and the college’s social media accounts on Facebook and Instagram. It is the responsibility of the person signing as the authorized representative of the group to remain on the premises throughout the period for which it is reserved, to ensure the safety and security of the attendees and College facilities and to further ensure that that attendees observe the policies governing the public use of the College’s facility and meeting rooms. College facilities and meeting room guests agree to pay for any and all damages to college property including, but not limited to walls, floors, grounds, and furniture while guest is using the property. Filling out this form does not guarantee your room reservation. Reservations are on a first come, first serve basis, but certain event types and organizations do take precedence. The room reservation is not confirmed until you have received a confirmation email. Any questions on availability may be sent to officeofinstruction@oregoncoastcc.org but room requests will only be accepted via this form. We recommend making reservations at least 2 weeks in advance. Payment of any required fees must be made prior to event, or on the day of the event. An invoice will be mailed to the address provided on the form, with cash, check, and credit card accepted as payments. Cancellations must be made at least 72 hours in advance to receive a refund. There is always the possibility you will be notified of a room change as the college has preemptive rights when it comes to room requests, in which case your event will be accommodated in another, similar room. The use of chairs, tables and lectern may be reserved, subject to availability. Audio-visual equipment (including television, projector, microphone, speaker system, etc) may be reserved for an additional fee. The use of the Newport campus community room kitchen is an additional fee. An indication of these requirements must be made on the application form. *Room rentals are not guaranteed on days when the college is not open, such as weekends. If outside rental hours an additional fee of $25 per hour is required for the on-site security. In the case of inclement weather a notice will go out via FlashAlert, and a message will be made on Oregon Coast Community College’s website, Facebook, and Instagram whether or not the school is closed or experiencing a delayed start. We recommend signing up for FlashAlert or following one of OCCC’s social media accounts so you are kept up-to-date should any of your events fall on a day when this happens, as the delayed start/closure will apply to your event. The college will offer the opportunity to reschedule at no additional cost or refund the cost of the room rental, as the guest prefers. An additional $100.00 fee may be charged if the room is not left in a clean condition.